If you’re a regular reader, you’ve come to understand Naples Zoo’s conservation reach from our backyard to Brazil and from Madagascar to Malaysia. As director of conservation, I highlight these field programs to inspire hope for saving animals in nature. But that is far less than half our story. 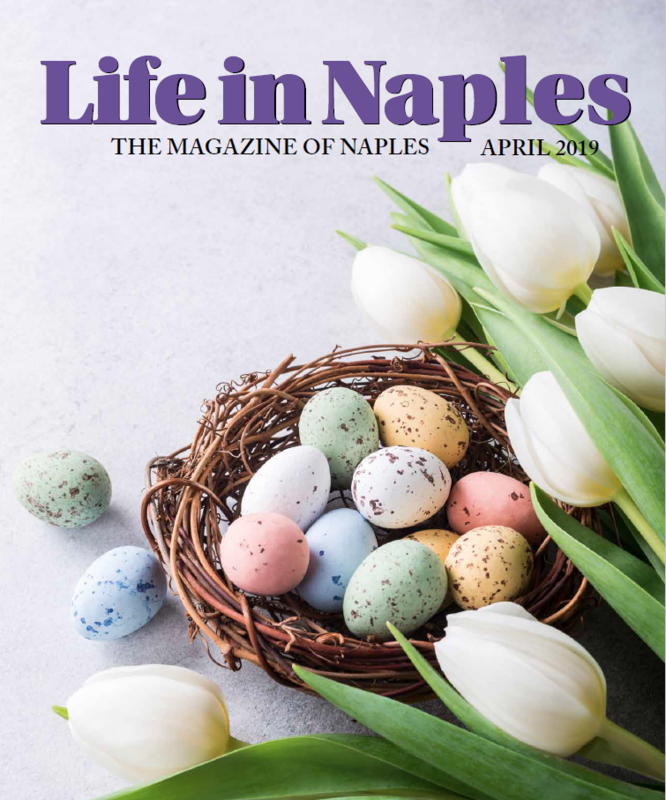 The animal care expertise represented by the biologists, zoologists and veterinary staff at our nationally accredited zoo enable us to contribute to truly crucial conservation efforts right here in Naples. The latest of these efforts you can see here is embodied in our two new mountain bongo. Largest of the forest antelope, these colorful creatures can weigh up to 880 lbs. Unfortunately, their large size has not offered them protection. In addition to loss of their forest homes, they were hunted out over a century ago in Uganda and only about 100 of these beautiful antelope remain in Kenya highlands – and these survivors are divided into four isolated populations where they are still being illegally snared for their meat. But while wild populations were declining, accredited zoos had been carefully breeding mountain bongo. And in 2004, accredited zoos returned 18 bongos to the Mt. Kenya Wildlife Conservancy in Africa. These bongo live and breed with limited human interaction. I was grateful to see them passing by in the forest and took these images on my last visit to Kenya. 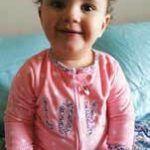 Better yet, the genetics of the remaining populations in nature and those in human care have enough diversity that they can supplement each other to assist in their long-term survival. 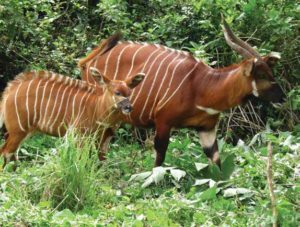 Today, there are more than 70 bongos awaiting reintroduction to the nearby hills at the proper time. their ancestry, to create the greatest genetic diversity in the population over the next century. Our pair arrived this spring from two different accredited zoos in Texas to contribute to the future of their species. In addition to the bongos, you will also be able to see another critically endangered species living with them – slender-horned gazelles. Found in the sparsely vegetated deserts of northern Africa, only a few hundred of these small gazelles remain outside zoos. A few years ago, Naples Zoo began supporting their survival by welcoming a bachelor herd. In the wild, one male will live with multiple females while groups of males will live together like ours. One by one, our males were selected for breeding elsewhere. Recently, the SSP selected a female for the one remaining male we have, who will join him this summer in hopes of saving this rare desert gazelle. A sulcata tortoise will also be joining the herd. 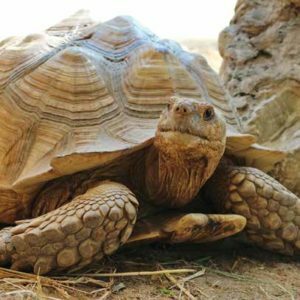 This desert tortoise is a northern African neighbor of the gazelles. Full grown, this tortoise can weigh between 100 to 200 pounds, but we’ve got years before ours will reach those weights. And a pair of black crowned cranes will also be seen walking among their four footed friends. No stranger to antelope, these wise birds often walk among herds to catch the insects disturbed by the larger animals. The International Union for Conservation of Nature (IUCN) Red List of Threatened Species™ lists both the tortoise and cranes as vulnerable to extinction in the wild. Efforts to focus the zoo’s resources to care for critically endangered species like these are spearheaded by Liz Harmon, Naples Zoo’s director of animal programs. Using the knowledge gained during three decades in accredited zoos and experiences across the planet, Harmon is strategically developing the advantages offered by our zoo and subtropical climate to assist species in need. connected world, that’s needed good news for both the animals you see at the zoo and those who can benefit in the forests a world away.